The partner can set SLA parameters on the SLA parameters tab when creating or editing a video resource. Note that all the parameters have preset values that work for most resources. The partner player requests a design (skin) from the Yandex RTB system. The RTB host returns the skin if it was added on the Appearance tab when creating or editing a video resource. Skin download timeout is set in the Player design download time-out tab. In response to an ad request from a player, the RTB host can transmit a wrapper (VAST wrapper, i.e. a response with redirection). The partner can set the maximum allowed number of redirections in the Maximum number of wrappers field, and the maximum download timeout for all responses with a wrapper in the All wrappers download timeout field. After the RTB host transmits the VAST wrapper, the ad is requested from the URL in the wrapper. The RTB host returns a VAST response. The partner can choose version 2.0 or 3.0 from the VAST version support list. The main difference is that VAST 3.0 allows skipping the ad. The partner can set how long to wait for the VAST response in the Advertising system VAST download timeout field. 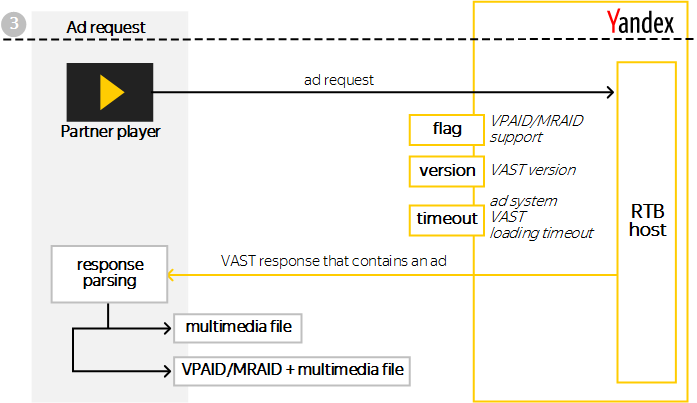 VPAID/MRAID support should be enabled to support VPAID/MRAID standards (they regulate interactive video ad formats). The partner can choose version 2.0 or 3.0 from the VAST version support list. The main difference is that VAST 3.0 allows skipping the ad. 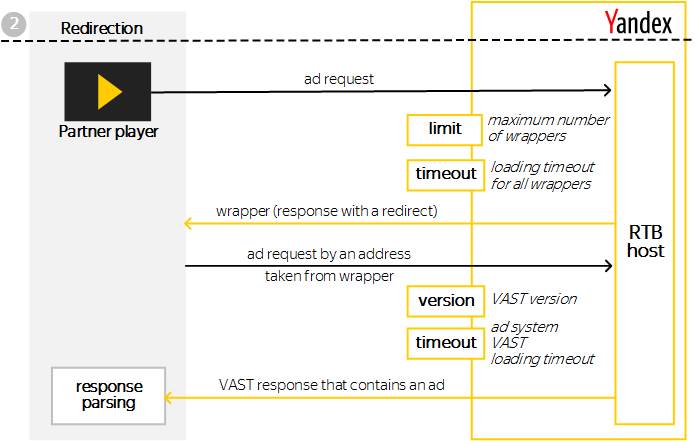 The download timeout for VAST response is set in the Advertising system VAST download timeout field. If VPAID/MRAID support is enabled, the partner can set VPAID/MRAID download timeout in the VPAID/MRAID download timeout field. 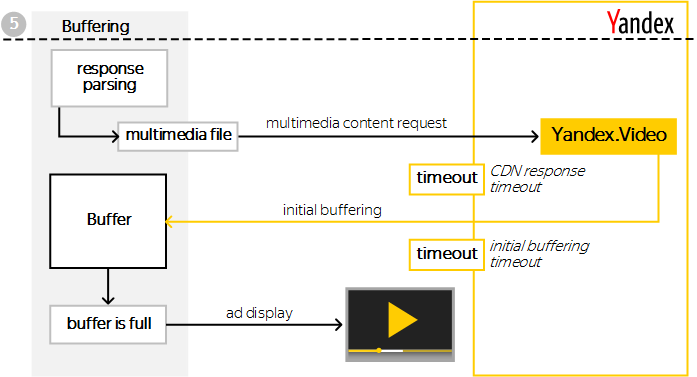 You can set a timeout for responses with media content (videos) in the CDN response timeout field. The partner can also use the Initial buffering timeout field to set a timeout for initial buffering when the video is downloaded; while the Maximum number of rebufferings field sets the maximum allowed number of buffer renewals.